This true story took place many years ago in a small town on the outskirts of Olean in western New York State. 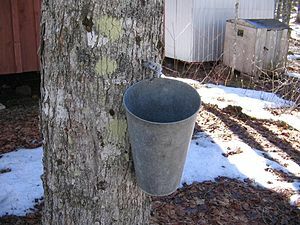 One spring day, on his way home from school, my 10-year-old son, Leo, noticed all the pails hanging on the sugar maple trees to collect fresh sap that was to be boiled down to make maple syrup. He rushed into the house, saying, “Hey, Mom, let’s make some maple syrup, OK?” Now, the making of maple syrup was not exactly one of my priorities, mind you, but I didn’t want to squelch his enthusiasm. So, I thought, “Why not? We could give it a try. It might be fun.” And so, the ill-fated plan was hatched. We waited until the following Saturday morning. Then, Leo borrowed his father’s drill and made holes in several nearby sugar maple trees. Inserting the spouts and pounding in nails to hold the collecting pails, he was now ready for the sap to start running. Sure enough, it wasn’t long before we had enough sap to start with. So we collected the sap from all of our pails into one larger container, strained the impurities out and poured the sap into my canning kettle. Setting it on the stove, we fired up the burner and began to envision delicious, homemade maple syrup for our pancakes. What a special treat that was going to be! Or so we thought. The sap simmered slowly for several hours, and I wondered, “Why do people go to all the trouble of making a fire outside in a well-ventilated sugar shack, getting cold and standing around all bundled up, when it was so easy to do it right in the comfort of your own kitchen?” Then I went about my housework while the boiling continued. I checked the kettle periodically and noticed that the boiling sap was just beginning to change to a very light brown color, characteristic of a high-grade maple syrup. “We’ll soon have some maple syrup,” said Leo excitedly, rubbing his hands together and licking his chops. But a little later, when I walked into the living room, our eager anticipation turned into alarm. I noticed a large, wet spot on the ceiling; then another and another! Then I noticed that the same thing was happening in the adjoining dining room too! Suddenly, a light went on in my head. That must be the reason for using the sugar shack; it allows the water vapor from the sap to escape through the vents, instead of condensing on the ceiling. In a panic, we stopped the boiling immediately, to prevent further damage to our ceilings; so much for our homemade maple syrup! That day both mother and son learned a valuable lesson by trial and error; a little bit of knowledge can be a dangerous thing. And we had plenty of time to let this little lesson sink in, as we waited anxiously for the wet spots on our ceilings to dry. I sure hope Mrs. Butterworth wasn’t watching! This entry was posted in Angie's Smorgasbord and tagged ceiling, home made, Humor, lesson, Maple, Maple syrup, Mrs. Butterworth, New York, Olean, Plant sap, short story, sugar maple, sugar shack, trial and error, vapor.